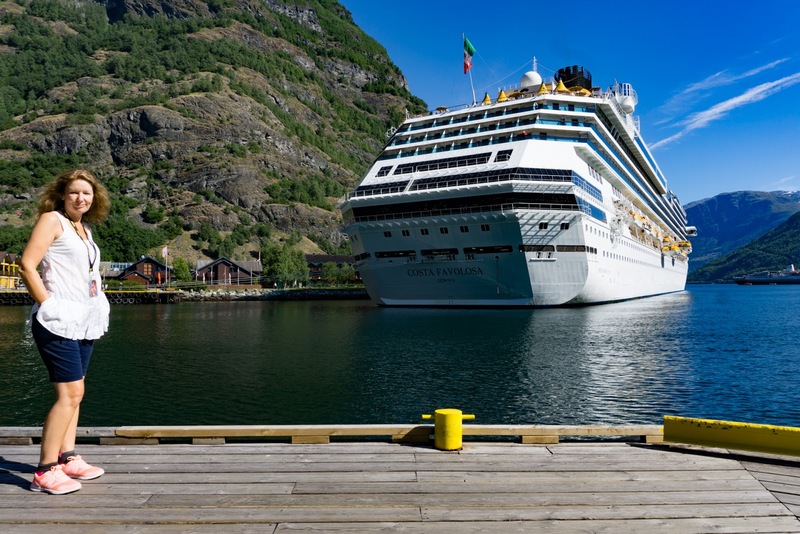 This cruise was probably one of the latest "last minutes" we have ever booked. 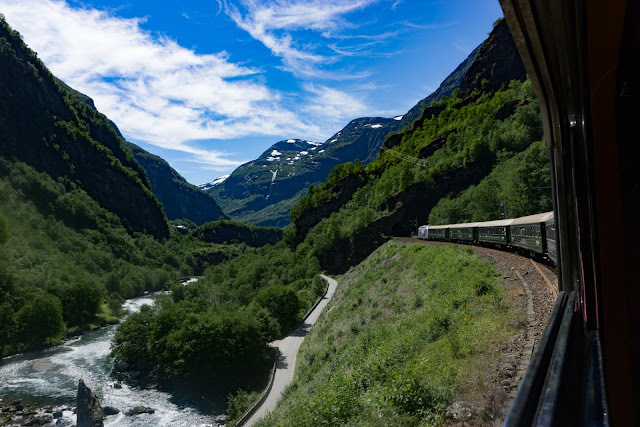 Some form of Nordic journey was always on our future trip list - but from reading other trip reports and blogs had some reservations about the weather: Would we be sailing down those beautiful Fjords in thick fog or spend sea days freezing to death - true Brits bravely clinging on to a sun lounger in torrential rain and North Sea gales? Nothing could have been further from the truth - if anything it was tooooo hot.. 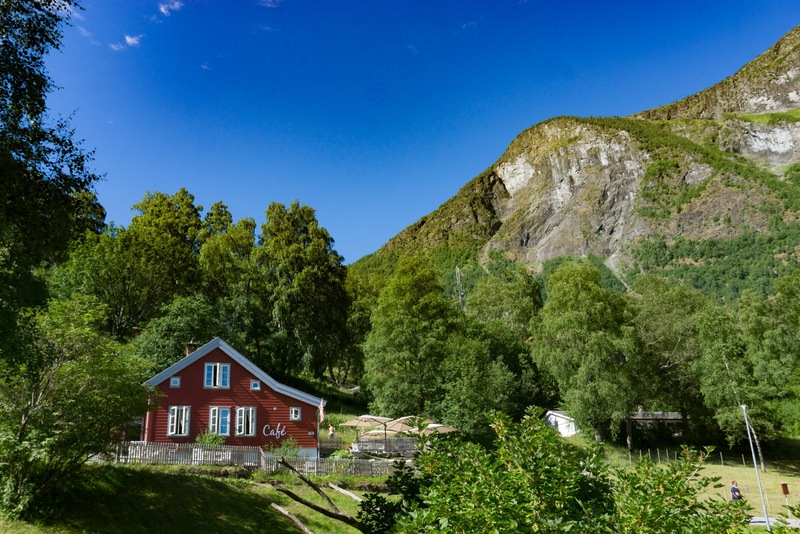 When looking for the itinerary we wanted something that would take in at least one of the long Fjords (preferably Flam) and hopefully lots of new ports to visit. We opted to take up a last minute deal with Costa and after adding a full wine/drinks/ "real coffee" package we still had paid a fraction of what NCL wanted for our balcony room. 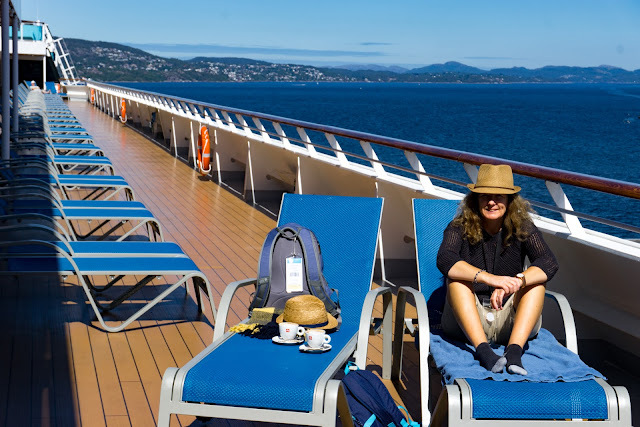 Its not our first time on Costa - our previous trip through the Med on the Diadema had been a huge success. The simple rule with Costa is don't go under the assumption your getting onboard an English or American brand and everything will be the same. 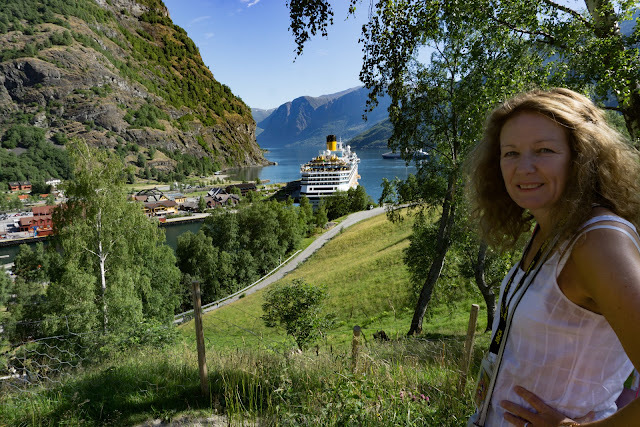 Traveling with Costa is like taking a little bit of the Med with you. With that in mind enjoy yourself and trust me - all the staff speak perfect English much better than they do Italian, French or German. 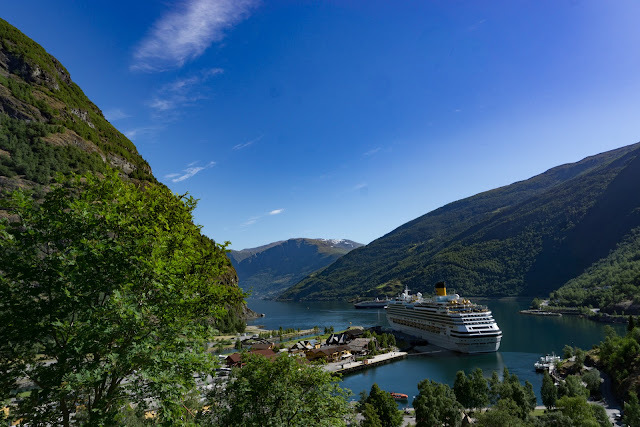 This particular cruise left from Copenhagen (a port we are now familiar with after last years Baltic cruise on the NCL Getaway). 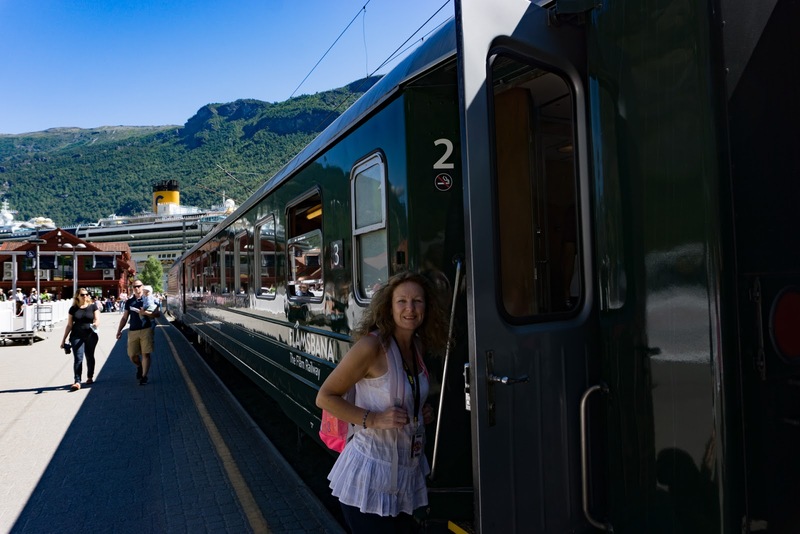 We arrived early morning and after a quick coffee, we bought tickets for the train and headed for Osterport. Note how you spell Osterport - it's not how I have spelt it and this will cause you an issue when you try to buy tkts from the automated machines. The Danish have a few extra vowels in the alphabet - so your looking for Østerport with a dash through it when using the A-Z search. The platforms for the railway are directly under the terminal. If you climb up from Østerport Station and turn left and see the Lille Fruehaven/ Little Mermaid sign, a regular shuttle bus will then take you directly to Oceanport Cruise Terminal - it runs every 20mins or so every day that there is a ship in the terminal - pay the driver on the bus. DKK30 ish. 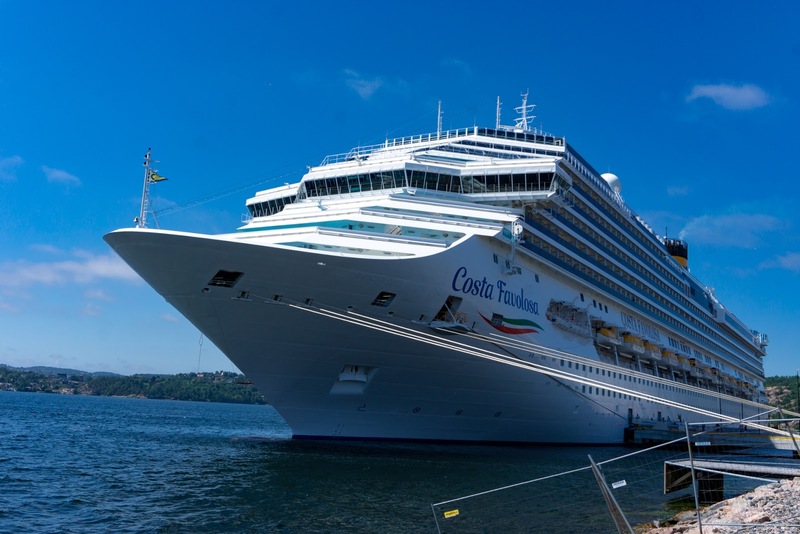 The ship in question is the Costa Favolosa - She's certainly a nice looking vessel; i.e. still resembling a cruise ship rather than a block of flats at sea. Internally the mad fonts and golden bling remind us of the Diadema though its actually a little more subdued with classic wood. We arrived at the dockside probably an hour or so before the official boarding time - mainly because the amount of activities one can do around Copenhagen whilst pulling a suitcase behind you is fairly limited - but we were checked in and sent onboard practically instantly. Looking at the lists on the desk it would appear most had boarded already the day before at Warnemunde, Germany and I can see we are two of four British boarding here. Our bags disposed of we head straight for the buffet and enjoy a lovely meal and wine in the relatively empty Ca'd'Oro dining room. The cabin is ready after lunch though our cases have not arrived so we freshen up and change (top tip - always carry a change in the hand luggage especially if its going to be a hot and sunny day). Our ship cards seem to have a little detail missing from them (namely where and at what time we are eating in the MDR) it's soon sorted out at the main desk - luckily its first sitting. We are not a big fans of this style of dining preferring the free style of NCL and Celebrity. To be honest we have already made alternative plans for the rest of the week and booked into Samsara and Club restaurants for most of the rest of the journey - remember if you already have Costa Club points you get these venues greatly discounted - considering the cost of the cruise its well worth the upgrade. 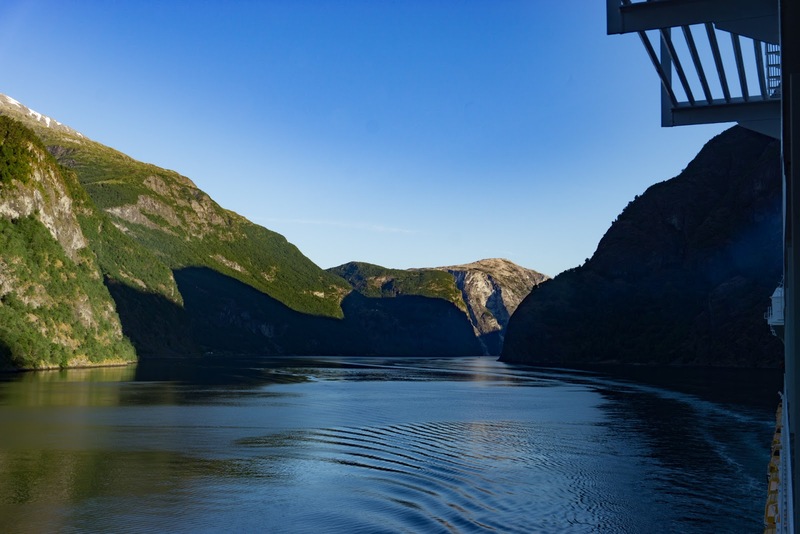 First day is a sea day as we make our way from Copenhagen to our northern most point Flam. Now I'm slightly biased but I know but my top tip would be to include Flam in your itinerary - yes you can sail or sleep your way down many gorgeous fjords - but the difference with Flam is the incredibly scenic mountain rail trip - but we're getting ahead of ourselves. 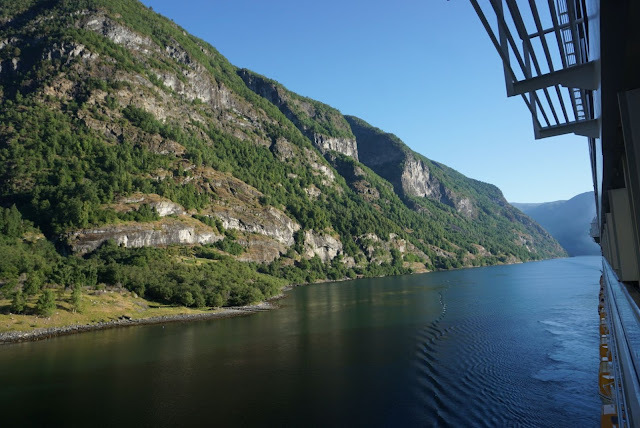 We sail slowly down the Sognefjord ( the longest & deepest in Norway)- the pilot boarding the ship at midnight for the slow 8 hour journey down the fjord towards Flam. 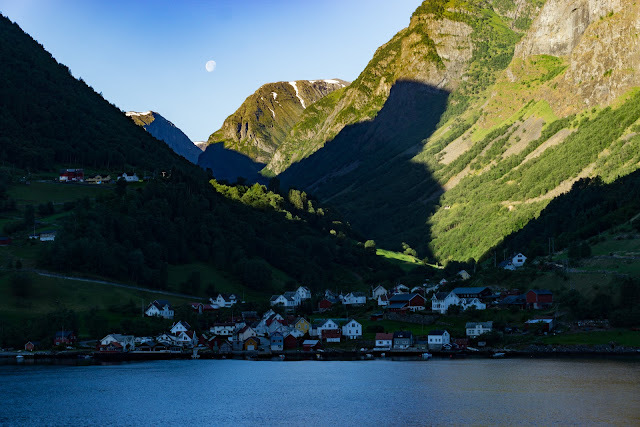 I awake at 5.30 to quietly take a look as we enter the final narrow sections to find the moon in the sky - the sun rising (it never really went dark - as when the sun does set it stays stubbornly just below the horizon at this latitude) and we are passing a small hamlet where life looks idyllic but I slightly suspect it's not when winter when snow arrives with all its might. 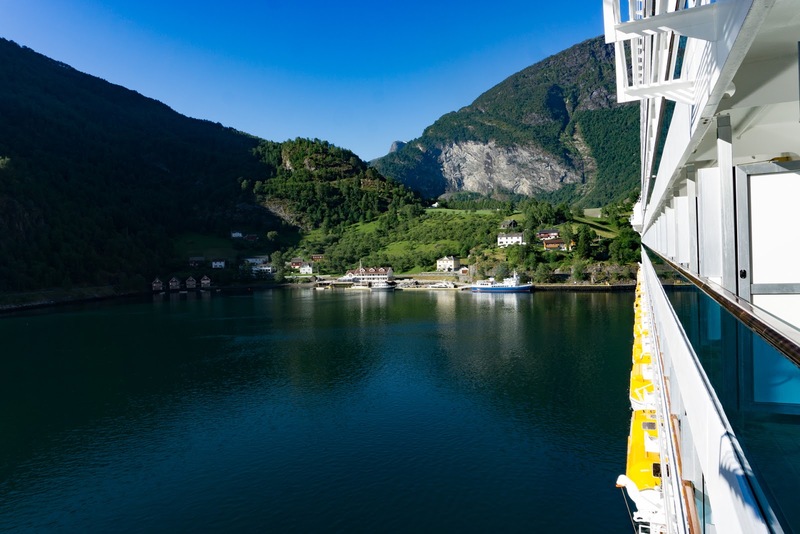 We are not alone as we manoeuver - twisting and spinning to slide into the dockside at Flam. 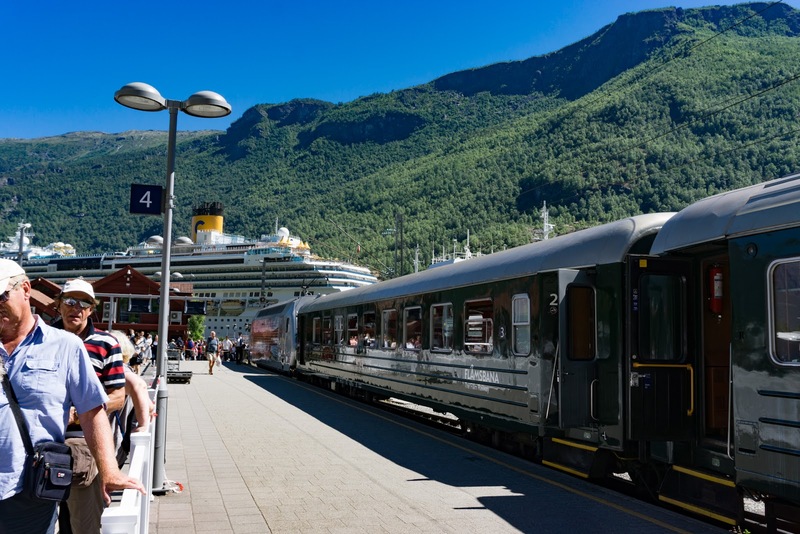 Already in situ in the middle of the fjord is Cruise and Maritimes "Marco Polo" which seems to have drawn the short straw and is having to tender its passengers to shore. 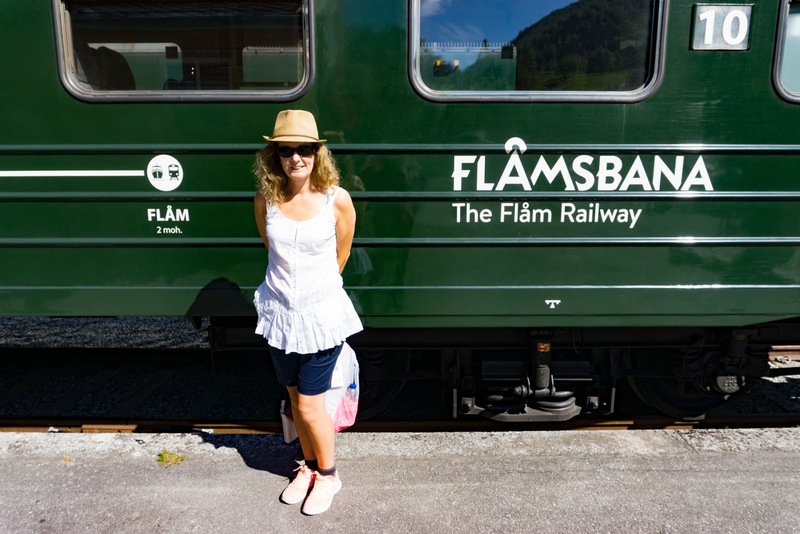 Flam is unusually hot - in fact this is the first holiday I have taken where I was hoping to escape the heatwave at home in the UK only to find it's here as well. The air is so crisp and fresh though, an impression that's reinforced as you look up beyond the walls of the deep valleys and see pristine snow clinging to the hill tops. We had already booked our mountain train tickets on line before we left the UK and have opted to take a trip in the afternoon after lunch. 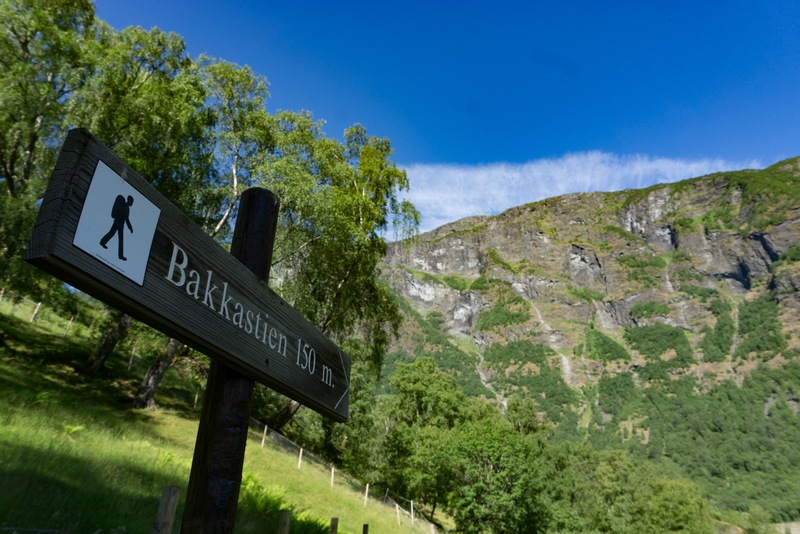 This gives us the morning to have a wander around Flam's small hiking trails climbing up to get a great view of the village, before descending and taking coffee in the Bakkastova cafe which has great views over the Fjord. Its also well placed at the intersection for many of the hiking trails. We do like to patronize coffee houses and bars in the towns and villages the journey brings us to - tourism is the main income for many of these places (though in Flam it will probably be the most expensive coffee or beer you have ever come across)and it seems a little unfair to simply wander back to the ship. 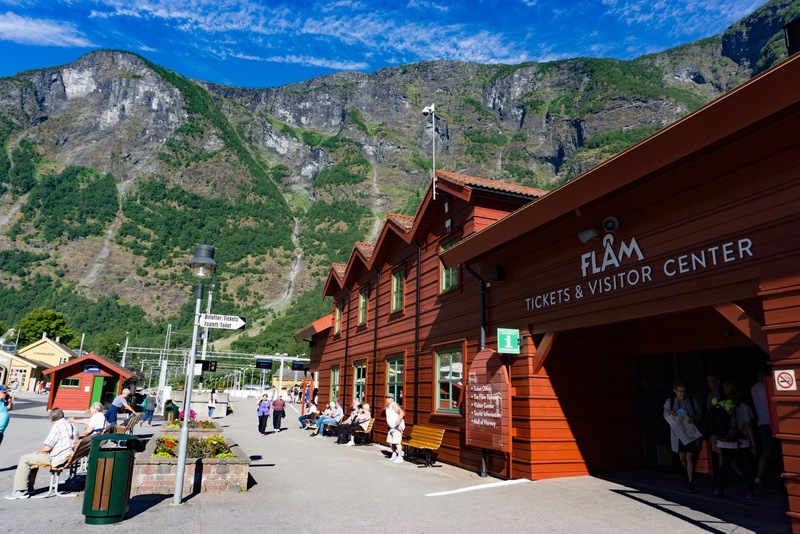 After lunch we head over to the railway and board The Flam Railway. 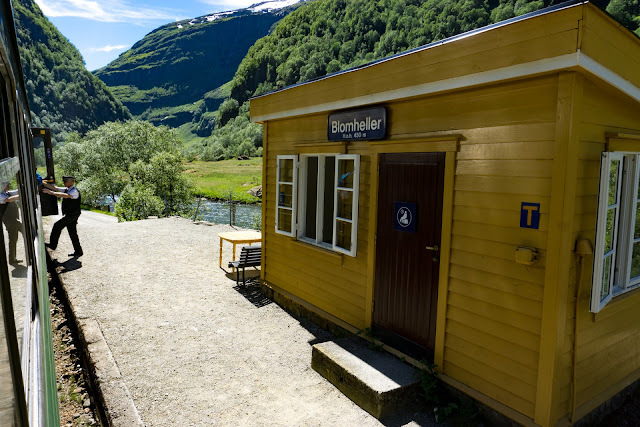 We have bought a return ticket to the summit at Myrdal which is some 866m higher up. 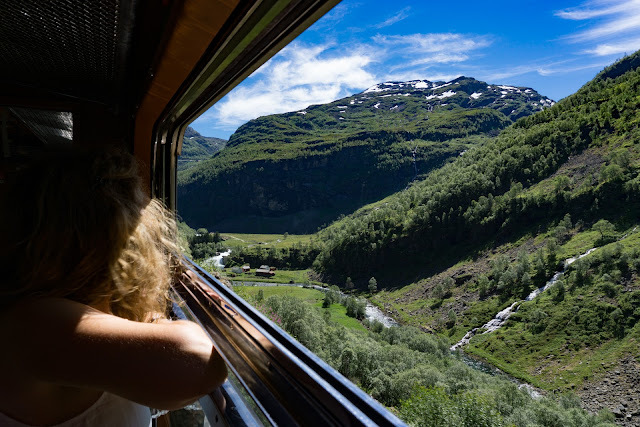 The train is an absolute must do when in Flam. 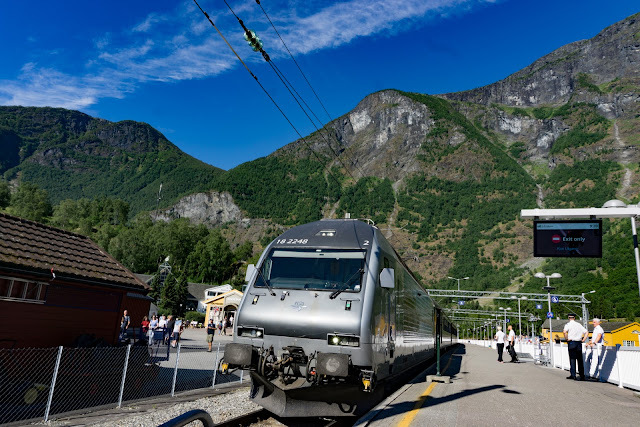 The station is a short walk from the ship and you can wander across and join the queue to buy tickets or simply print your ticket at home and forget about queuing up in the station; just walk straight onto the platform and off you go through some of the most breath taking scenery you will ever see. 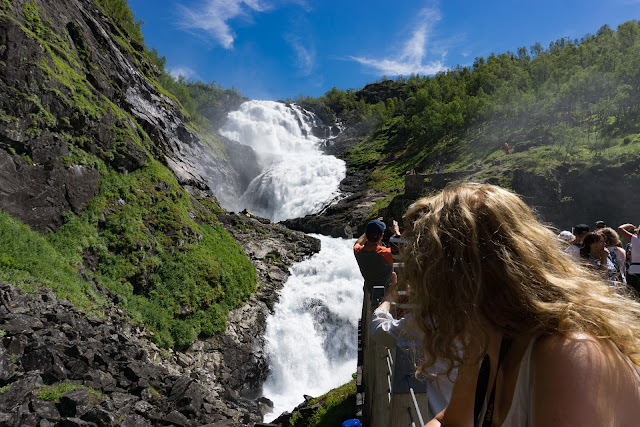 Do not forget to leave the train at Kjosfossen - the train makes a stop here for 5mins so you can take in the sheer power of the waterfalls. 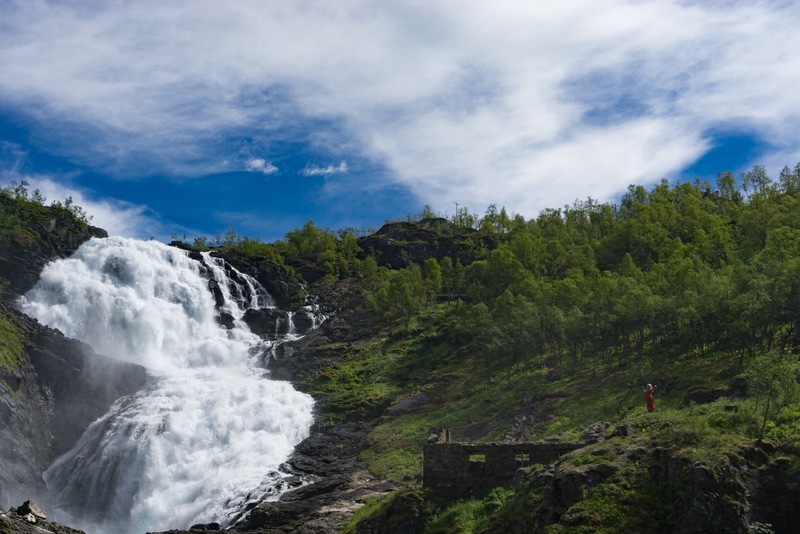 Eerie music plays and a lady in red appears from a small building to the right of the falls and performs a dance based on the Nordic mythology - it also helps give some scale to the sheer size and power of these falls. 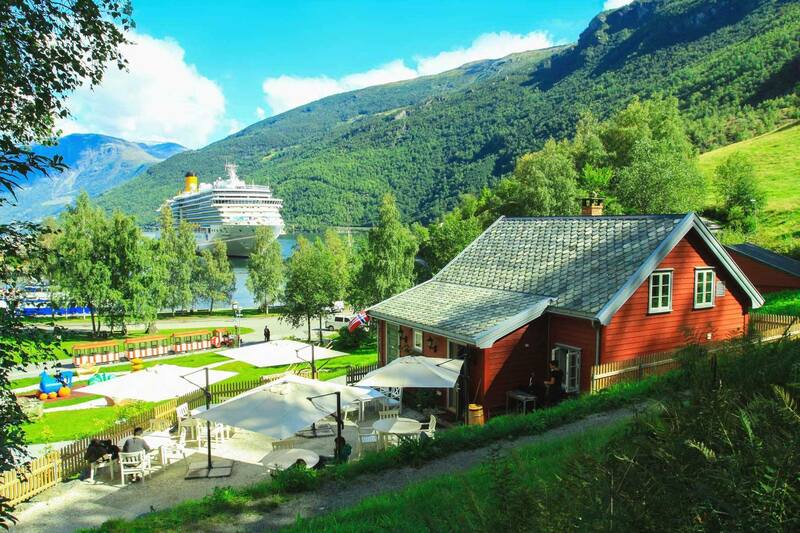 The view out of the window is simply breathtaking as the ship threads its way back down the Fjord. Dinner tonight is in the Samsara Restaurant, much more intimate and refined than the MDR with better lighting . Food in the Samsara is as good as on the Diadema with perhaps one point removed for the Monkfish being a little overcooked. That coconut infused rissotto is just so mmmmm. 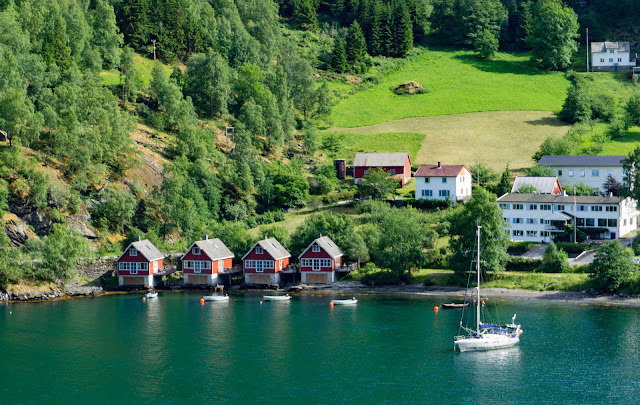 Tomorrow we head south, the next port being the city of Bergen.